The P08 was one of the many pistols used by the German army during WW2 thanks to its solid construction and power. 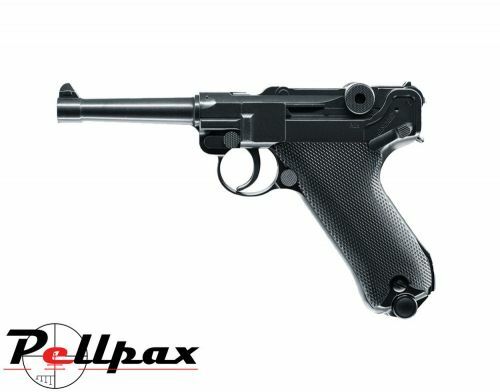 This version by the German company Umarex is a solid replica of this original pistol and incorporates a clever blowback system which makes it look and feel just as the original would. The frame of the pistol is made from metal which provides a solid weight to it as well as ensuring the moving parts wear much better over time. The magazine is also metal and holds the CO2 and BBs so its easy to reload. The trigger is a double action only unit which means that it will only fire the pistol once it has been cocked, with the subsequent cocking being done by the blowback function so you can fire off a magazine as quickly as you can pull the trigger.